The Center for East Asian Studies hosted a “Roundtable on Race in Asian America” for students, staff and faculty on Sept. 29. Participants were encouraged to discuss what it means to be Asian American and share personal stories. 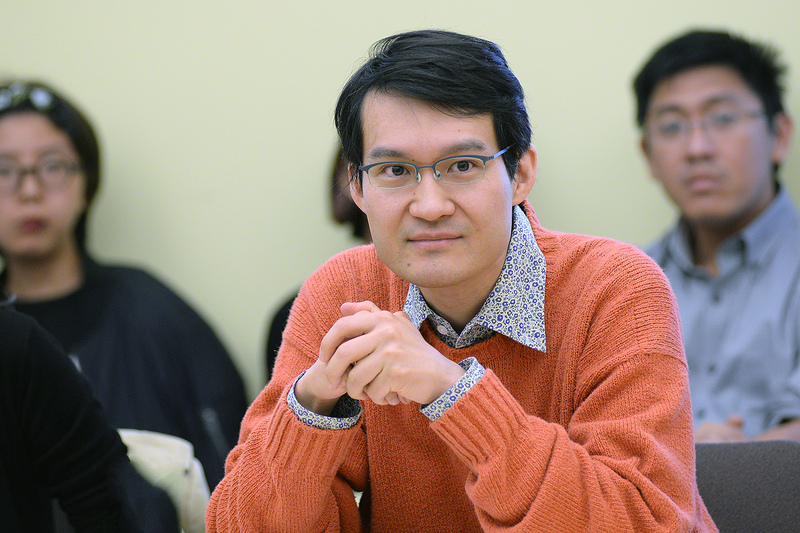 Pictured is Takeshi Watanabe, assistant professor of East Asian studies. 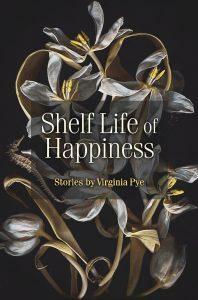 Watanabe teaches Japanese Culture through Food and Life in Premodern Japan. 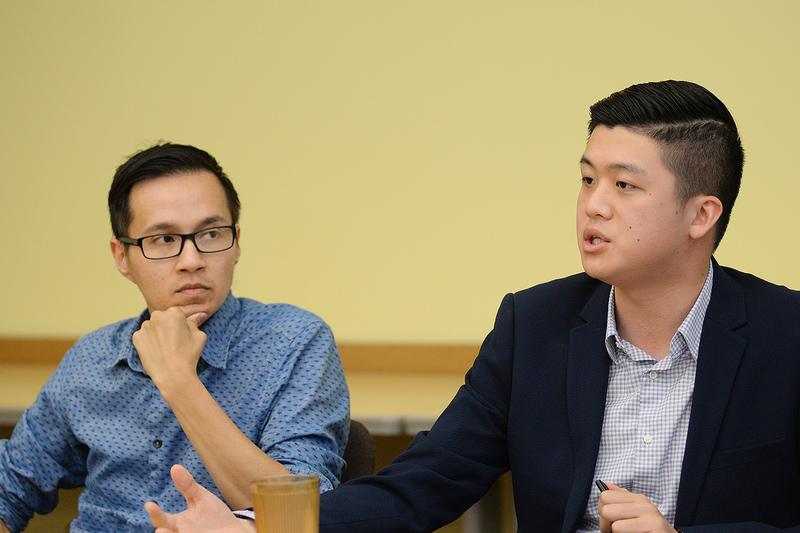 At left, Long Bui, visiting assistant professor of American studies, and Alton Wang ’16 moderated the discussion. While at Wesleyan, Wang studied sociology and government, chaired the Asian American Student Collective and taught a course on Asian American history. He currently works in Washington D.C. at Asian and Pacific Islander American Vote and serves on the Board of Directors for the Conference on Asian Pacific American Leadership. 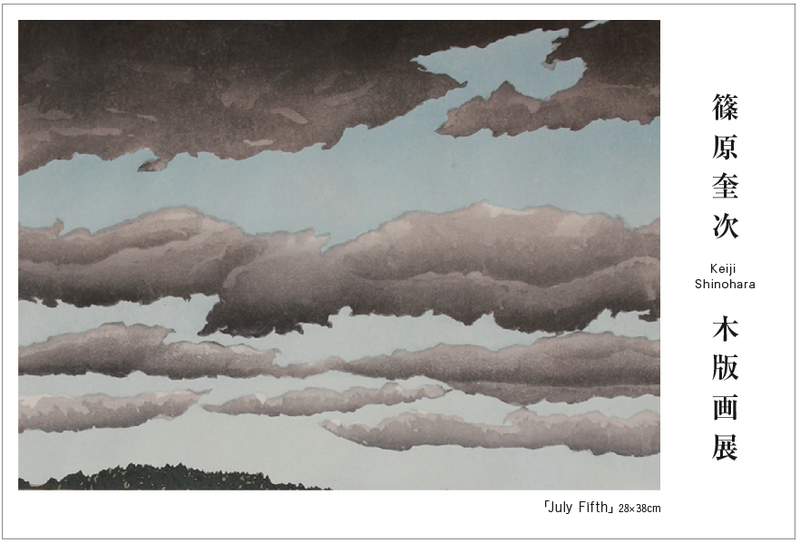 The student-curated exhibit Draw Yourself In is on display in the College of East Asian Studies’ gallery through Dec. 9. Featuring some of the Mansfield Freeman Center’s finest works, Draw Yourself In is an audience-participation exhibit and gallery-goers are encouraged to reimagine the exhibited works in new forms and mediums. 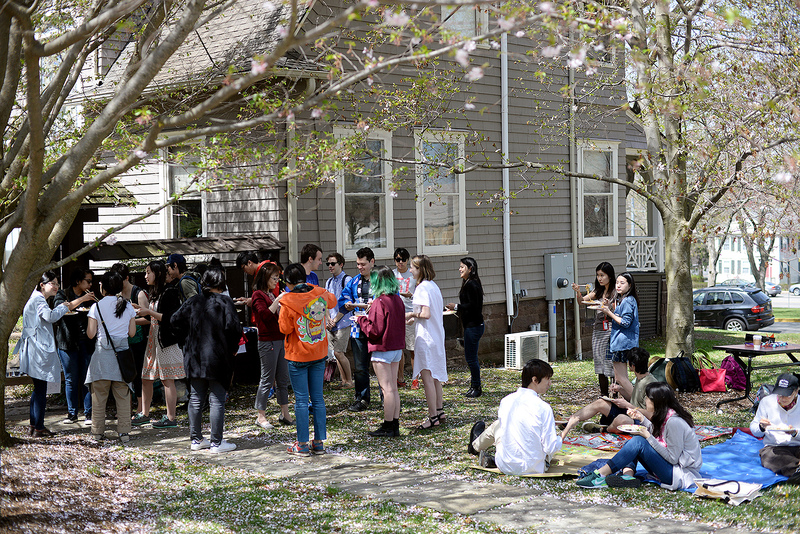 The College of East Asian Studies sponsored cherry blossom festival (Hanami) April 21 at the Mansfield Freeman Center for East Asian Studies. 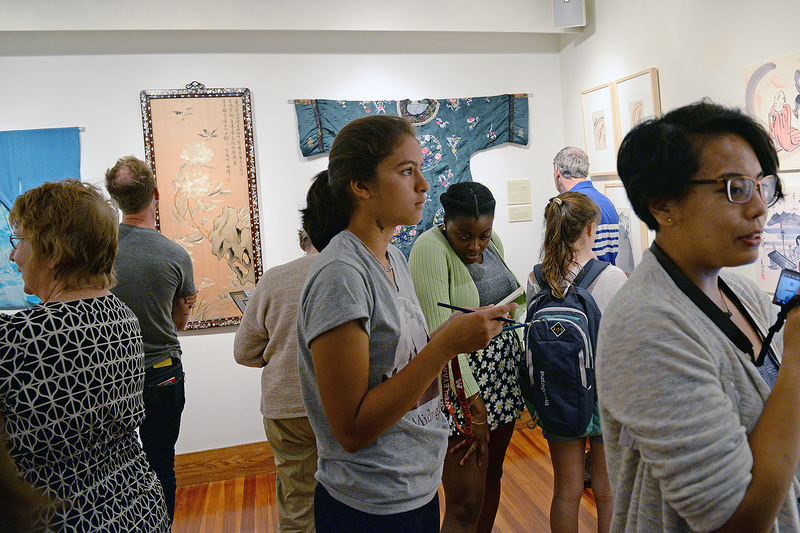 The annual event is attended by students taking Japanese courses, students from Japan and students and faculty who are interested in Japanese culture. Hanami is the Japanese traditional custom of enjoying flowers (hana) and generally involves an outdoor celebration. This year, the group enjoyed sushi and other Japanese foods. 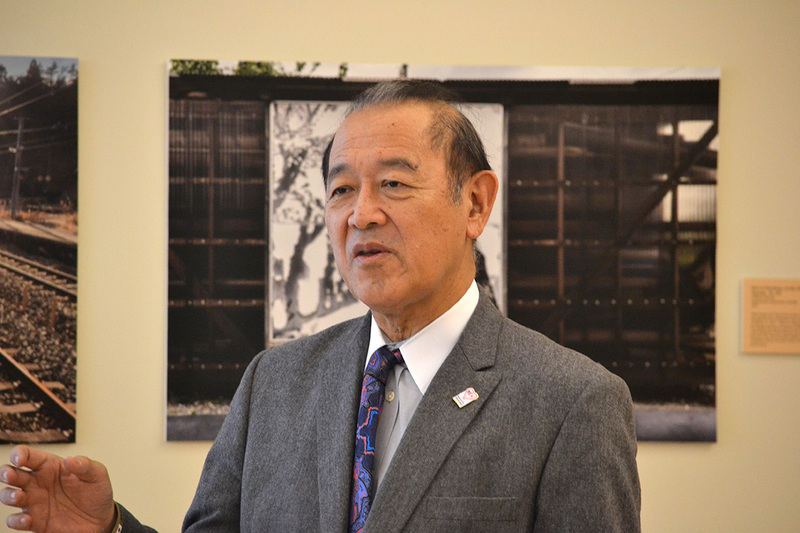 The event was sponsored by the College of East Asian studies and Japan Society. 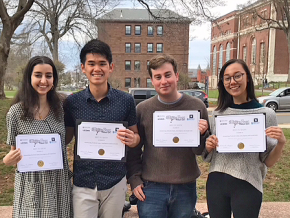 Wesleyan students Yuhan Wang ’19, Sasha Guo ’18, Sifana Sohail ’18 and David Cabanero ’19 participated in the Five College Korean Speech Contest on April 1. 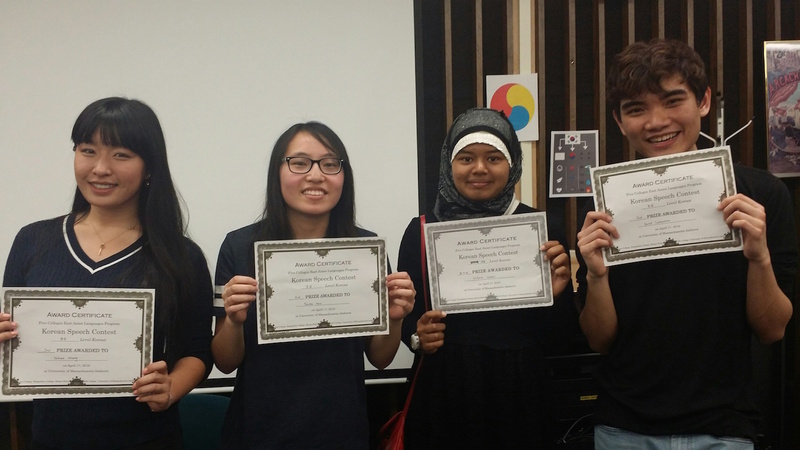 Four Wesleyan students recently participated in the Five College Korean Speech Contest, and three went home with prizes. 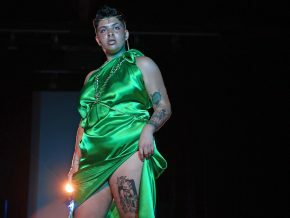 The contest was held April 1 at the University of Massachusetts–Amherst and included students from Amherst, Mount Holyoke, Smith and Hampshire colleges, and the University of Massachusetts–Amherst. The contest is sponsored by the Five College East Asian Language Program. Students in the Five College Consortium, and others in the New England area who are currently enrolled in Korean language classes, are eligible to participate, except for native Korean speakers or heritage learners. Participating students must write their own short speeches in Korean. 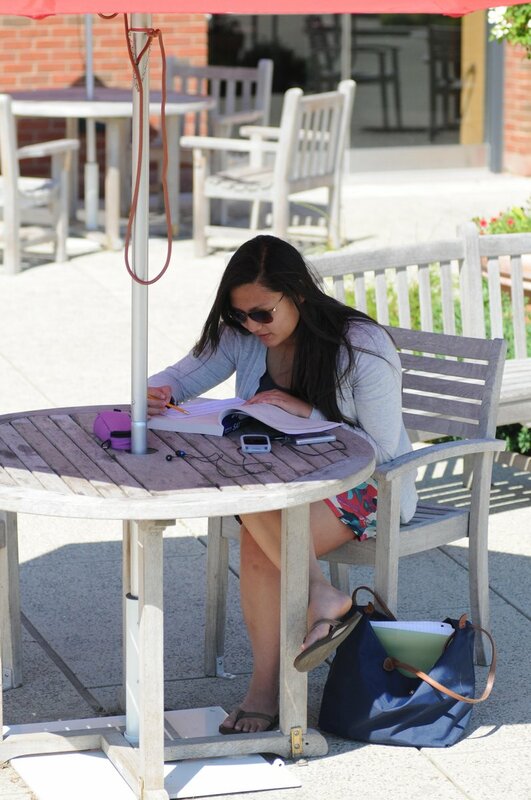 Visiting Assistant Professor of Korean Hyejoo Back served as a judge in the contest last year, and upon returning to Wesleyan, immediately introduced the contest to all her students. At the elementary level, David Cabanaro ’19 won second place with a speech titled, “My Precious Korea,” and Yuhan Wang ’19 won third place with a speech on “My Trip to Korea.” At the intermediate level, Sasha Guo ’18 won first place with a speech on “Banana.” Also participating was Sifana Sohail ’18. “Environment in East Asia” was the topic of the inaugural College of East Asian Studies Student Conference held March 25. 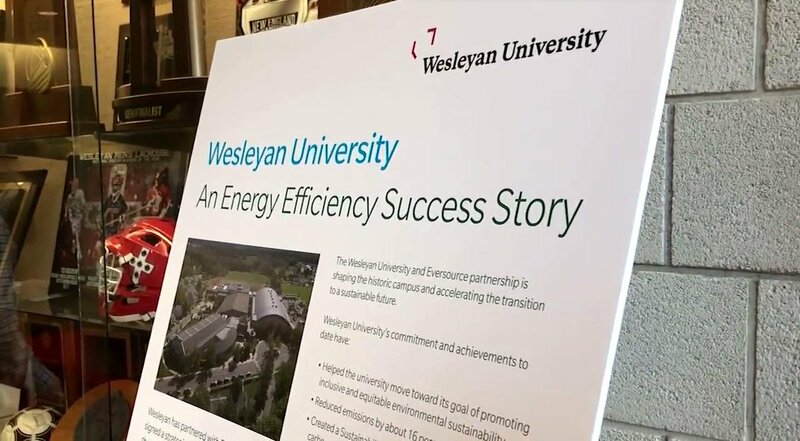 The conference included an interdisciplinary panel of Wesleyan faculty discussing issues related to the environment in East Asia; break-out sessions conducted in four languages (Chinese, English, Japanese, Korean); and a wrap-up session to bring all conversations together. 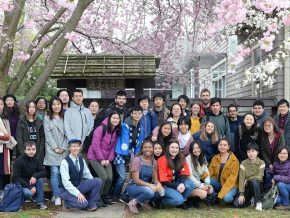 More than 60 students gathered in Beckham Hall for the College for East Asian Studies Student Conference, “Environment in Asia,” co-sponsored with the Center for Global Studies and the Center for Pedagogical Innovation on March 25. Professor of Government Mary Alice Haddad, Associate Professor of Music Su Zheng, and Associate Professor of Film Studies Lisa Dombrowski offered their discipline as a lens through which to view environmental concerns in the region— from using political action to regulate pollution, to music videos that call attention to smog concerns, to films that highlight the surreal aspects of man-made structures that change the landscape. Following the talks, students adjourned small discussion groups. 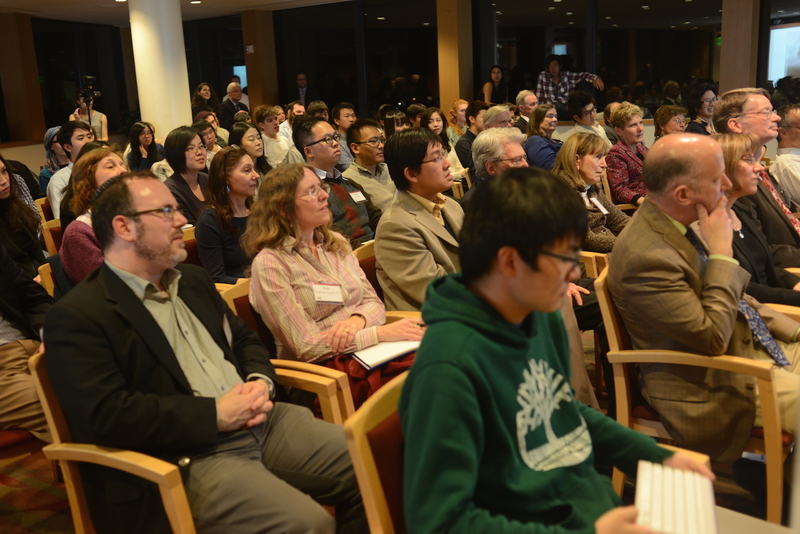 The conference was unique in offering conversation in each of four languages, noted Haddad, who is also chair of the College for East Asian Studies and professor of East Asian studies and professor of environment studies. 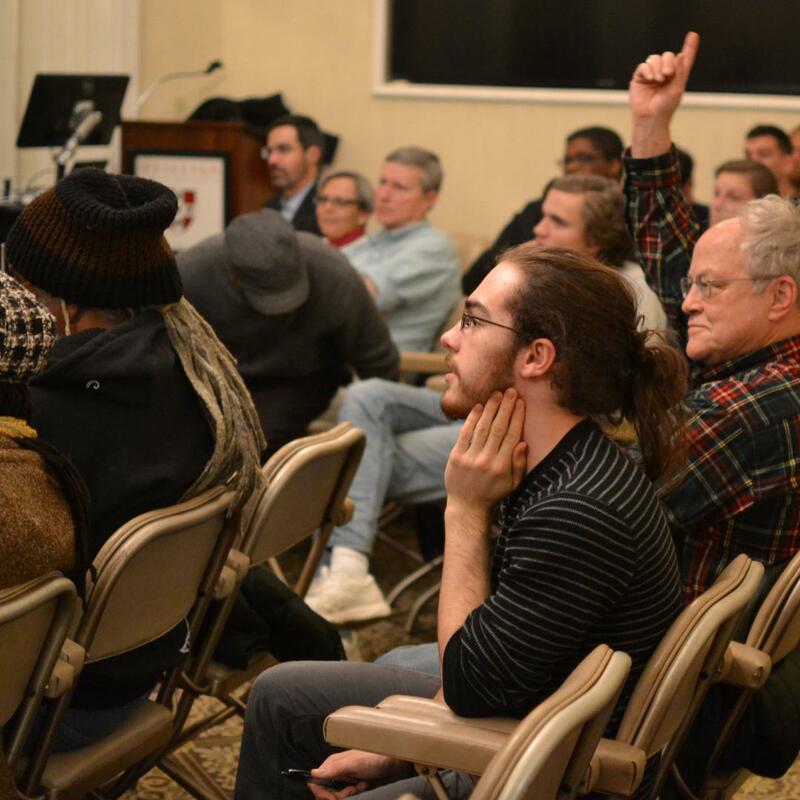 After the sessions, the students and professors then convened to bring their observations back to the group—and to plan similar events. 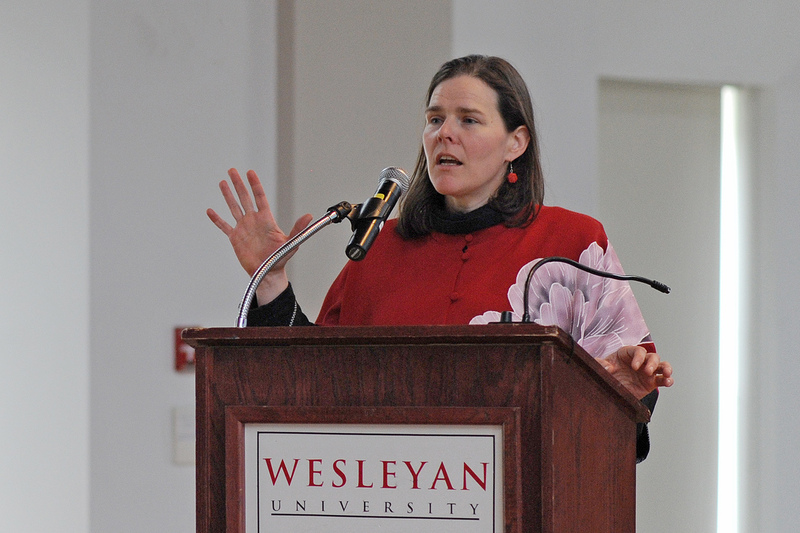 Haddad was pleased with the conference, calling it “an extraordinary event that highlighted everything that is so special about Wesleyan.” She said, “Students from around the globe interacted in multiple languages discussing one of the most important issues of our time. 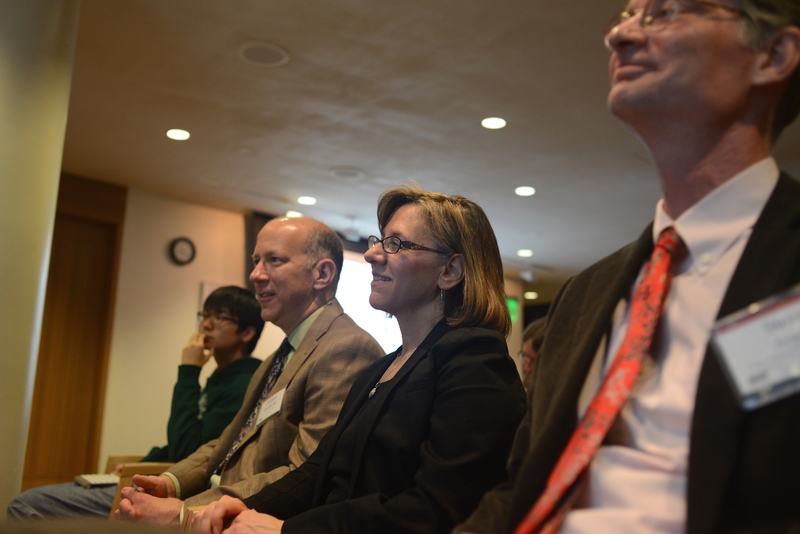 Faculty from different disciplines illuminated and discovered new insights as we discussed our work in the interdisciplinary panel. Professor of Government Mary Alice Haddad spoke on “Environmental Politics in East Asia.” Haddad also is chair and professor of East Asian studies and professor of environmental studies. 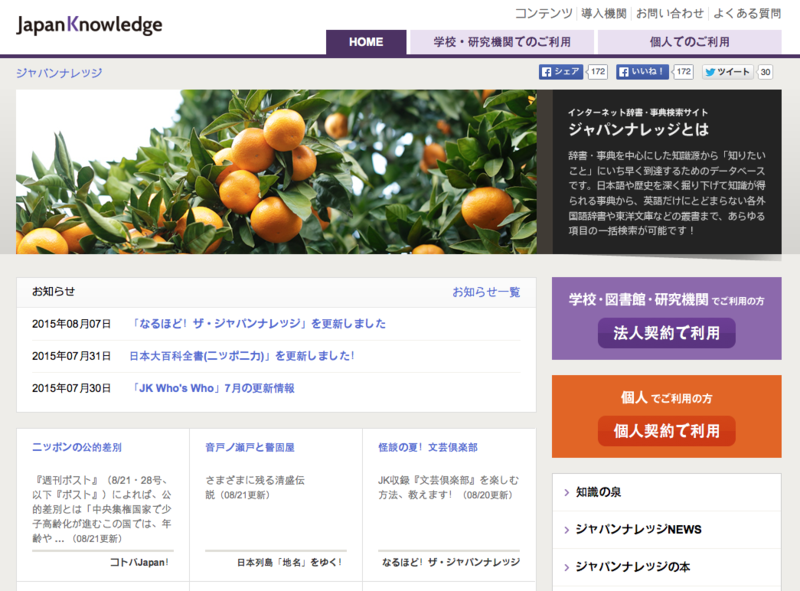 With support from The Japan Foundation, Wesleyan acquired three electronic databases including JapanKnowledge, a large collection of language dictionaries, encyclopedias, biographical dictionaries, and other Japanese reference works for Japanese-only searches of historical terms and figures. It includes an abbreviated version of the Kodansha Encyclopedia of Japan in English and full-text coverage of the Toyo Bunko and Shan Ekonomisuto (Weekly Economist). 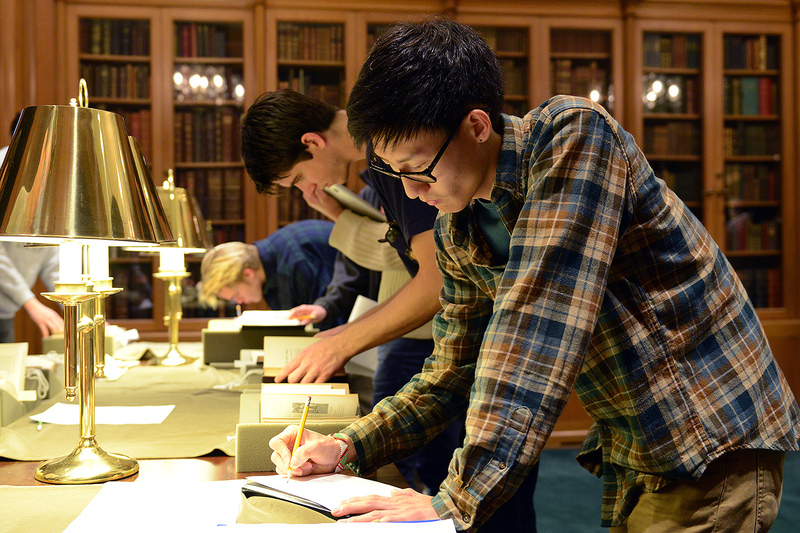 The College of East Asian Studies (CEAS) received two major, multi-year grant awards to hire new faculty and improve library resources. The Korea Foundation has awarded the CEAS a $314,330 five-year grant to support the hiring of a tenure-track faculty member in Korean political economy. The mission of The Korea Foundation is to promote better understanding of Korea within the international community and to increase friendship and goodwill between Korea and the rest of the world through various exchange programs. Located in Seoul, the foundation was established in 1991 with the aim to enhance the image of Korea in the world and also to promote academic and cultural exchange programs. 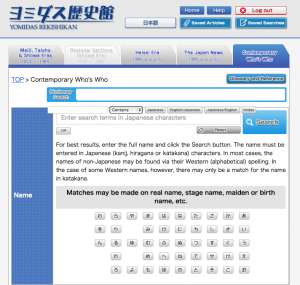 The Japan Foundation grant also supports the Yomiuri Rekishikan, a full text database of the Yomiuri Shinbun newspaper from its initial publication in 1874 to date. 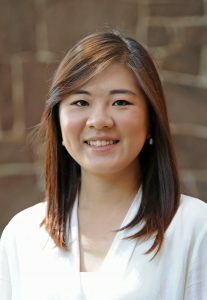 The Japan Foundation has awarded the CEAS a four-year grant to support a tenure-track faculty position in pre-modern Japanese literature as well as fund the library’s acquisition of new Japanese language digital materials, managed by EunJoo Lee, head of access services, at Olin Library. 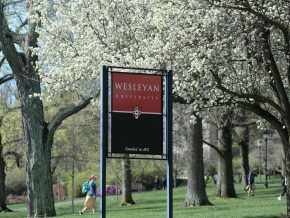 During the first year, Wesleyan will receive $197,125. The new databases include JapanKnowledge, a large collection of language dictionaries, encyclopedias, biographical dictionaries, and other Japanese reference works for Japanese-only searches of historical terms and figures; the Kikuzo II Visual for Libraries Database, which provides access to the newspaper Asahi Shimbun (full text from 1984 to the present); and the Yomidas Rekishikan database, which provides the full text of the Japanese newspaper Yomiuri Shimbun from its initial publication in 1874 to date, as well as full text of the Daily Yomiuri, its English language equivalent, and a biographical dictionary of modern Japanese figures. The Japan Foundation, based in Tokyo, aims to deepen the mutual understanding between the people of Japan and other countries/regions. The foundation was established in 1972 as a special legal entity supervised by the Ministry of Foreign Affairs with the objective of promoting international cultural exchange through a comprehensive range of programs in all regions of the world. The faculty searches for both faculty positions will begin this fall with the new hires starting in the fall of 2016. Mary Alice Haddad, chair of the College of East Asian Studies, professor of government, associate professor of environmental studies, is overseeing the CEAS awards. For more than four decades, Schwarcz has grappled with intellectual dilemmas surrounding a changing reality in China. 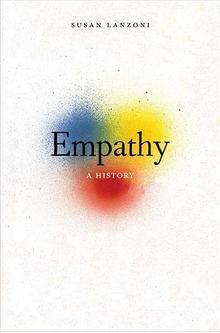 She has written extensively about comparative history, trauma and memory, as well as the role of intellectuals in the pursuit of the truth. 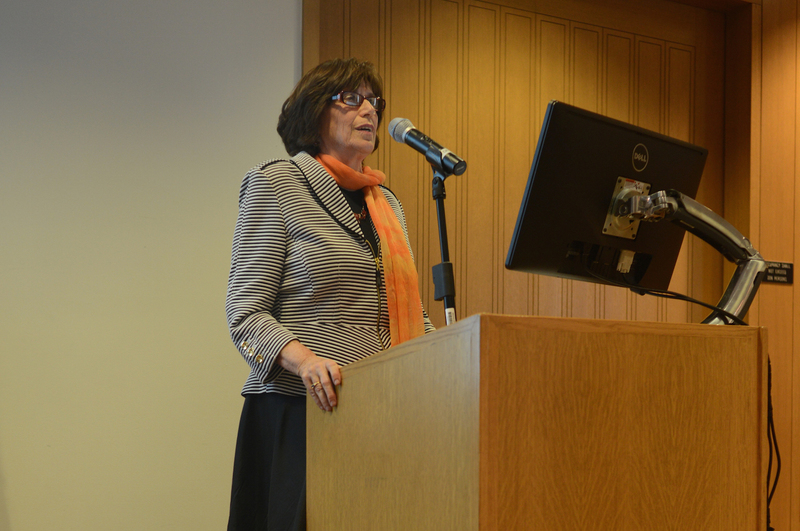 In her lecture, Schwarcz offered a retrospective gaze upon the turning points in Western understanding of China, and upon the impact of the Freeman Legacy in East Asian Studies at Wesleyan. She also examined the cultural context that shapes our shifting views of China today. Since 1976, the Mansfield Freeman Lecture has featured an outstanding scholar or other luminary in the field of East Asian Studies. 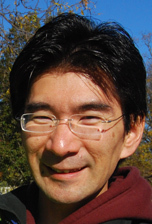 Masami Imai, professor of economics, professor of East Asian studies, is the co-author of an article titled “Attribution Error in Economic Voting: Evidence from Trade Shocks,” published in the January 2015 edition of Economy Inquiry, Volume 53, Issue 1, pages 258-257. 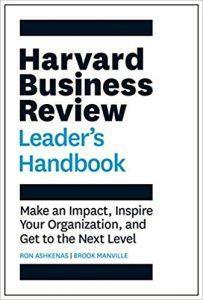 Rosa Hayes ’13, currently a research analyst at the Federal Reserve Bank of New York, also is one of the paper’s co-authors. This article exploits the international transmission of business cycles to examine the prevalence of attribution error in economic voting in a large panel of countries from 1990 to 2009. Masami and his co-authors found that voters, on average, exhibit a strong tendency to oust the incumbent governments during an economic downturn, regardless of whether the recession is home-grown or merely imported from trading partners. 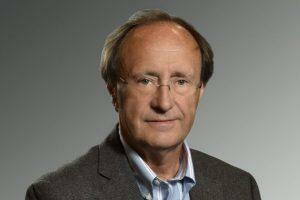 The authors also found an important heterogeneity in the extent of attribution error. A split sample analysis shows that countries with more experienced voters, more educated voters, and possibly more informed voters—all conditions that have been shown to mitigate other voter agency problems—do better in distinguishing imported from domestic growth.